Model NO. 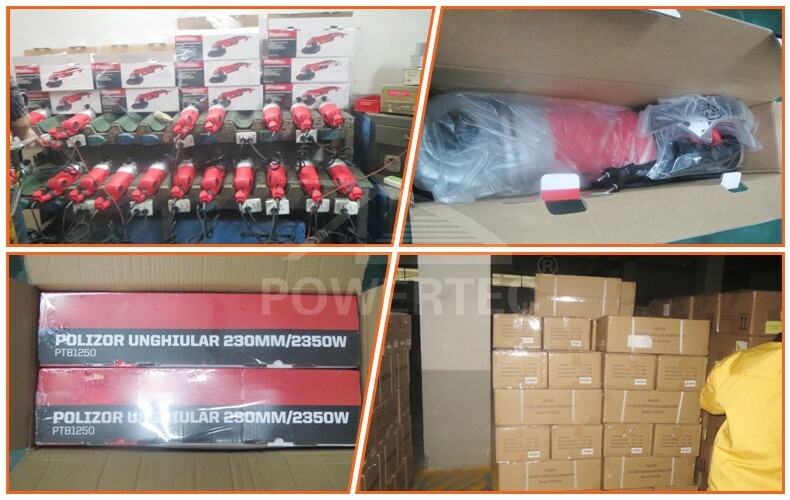 : PT81250 Power Source: Electricity Application: Daily Use Material: Metal Disc Diameter: 230mm Input Power: 2350W N.W/ G.W: 13.5/14.5 Kg(2PCS) Transport Package: Color Box+Carton Origin: Zhejiang, China (Mainland) Type: Angle Grinder Object: Milling Cutter Disc(Wheel) Type: Grinding Disc Working Style: High-speed universal Variable Speed: Without Variable Speed No-Load Speed: 6000/Min Trademark: Powertec Specification: 58*28*19cm /2pcs HS Code: 8467291000 Product Description: POWERTEC 2350W 180mm 230mm Angle Grinder electric Power Tools. *Spindle lock; *Soft grip handle; *Side handle. Packaging & Shipping: Instruction: It's Color for housing,labels and outside packings can be arranged according to detailed request from customers. from customers. The MOQ for each item is no less than 300pcs,but there are always some discount if the quanlity for single item is big enough.